Do they charge a fee? - If so, it is a scam. A legitimate company will not charge you to work for them. Period. Occasionally, you will come across companies that charge for training, but most often they will deduct the cost from your first few paychecks. This is rare, however. Most companies will provide free training. There are also a few companies that will charge for the cost of having a background check performed on you. Again, this is pretty rare. Home business opportunities will often charge a start-up fee, which includes a kit containing product samples, training information and more. Don't confuse these opportunities with telecommute positions. 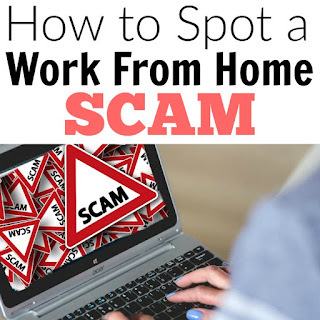 Very often they are advertised only as "work at home" -- not telling you whether it's a job or a business opportunity. If there is a start-up kit you need to buy, it is a business opportunity. If there is a "fee" to begin working for them (often called an application fee, or administrative fee), it is a scam. Is the website sloppy? - This alone doesn't always point to a scam. I've seen some legitimate companies with horrible websites too. However, scammer websites are usually very sloppily put together, with tons of spelling and grammatical errors all over the place. Not always - sometimes they do have web design knowledge and a spell-checker. Also, are they using a free web host like Geocities or Bravenet? (Example: If the domain name reads http://XYZClerical.bravehost.com or http://www.geocities.com/XYZClerical - they are using a free web host. Owning their own domain, it would read like this: http://www.XYZClerical.com) Website hosting is so affordable nowadays, it is rare to find any legitimate companies that would use a free web host. Contact information - Click on the "Contact Us" (or "About Us") page of the website. Is there a street address and telephone number? Or just an email address or P.O. Box? Legitimate companies will give you their true contact information. Is the email address from a free email provider like Yahoo or Hotmail? This doesn't always mean it's a scam, sometimes companies don't want to use their main address and get bombarded with resumes. Still, use caution if you see a free email account being used, especially if it's the only form of contact available. If a phone number is given, call it. Do they answer with the company name like a real business? Or do you get dumped right into a voicemail box? Again, that might not mean it's a scam by itself, just something to consider. Testimonials - Does the website feature testimonials? These are usually glowing reviews from people who are allegedly working at home for this company. Why would a company want to do this? Remember this: testimonials are most often used in sales copy. They are trying to "sell" you something if they use testimonials. Legitimate companies will rarely use them. I have seen a couple of real companies with testimonials on their websites, so it does happen, but not often. Targeting particular groups - Does the ad focus on one particular group of people like Moms, retirees or college students? This is usually a warning sign. Why would a legitimate employer care if their employees are moms, dads, grandparents or anything else? The only exception I can think of is perhaps contracts for models and actors. Obviously sometimes agencies have a need for people with a certain look, or from a certain age group. Otherwise, beware of any company advertising only to Moms or other groups. Involving your personal accounts - This is a biggie. There is a common scam going around right now that involves an overseas company wanting you to sell products on eBay using your own account, and accept payments from the buyers. You then subtract your "commission" and forward the rest of the money onto the company and they ship the product out to the customer. Wrong. What actually happens is the company takes the money and never ships the products, and you are now in big trouble with eBay for taking the money and not delivering the product. It is incredibly easy for legitimate companies to get a merchant account nowadays, there is no reason why they would need you to use your own account and forward the money to them. Don't fall for it. Another similar scam is a company (or individual) needing to send a large amount of money by check to you, they ask you to deposit the money into your account and then withdraw most of it (you get to keep a portion of it for your troubles) and send it to them by Western Union or other money transfer system. Unfortunately, the check takes a few days or even a few weeks to bounce, and you now owe that money back to the bank. Except you don't have it, because you already wired it out to the person who sent you the check! Steer clear of any type of "job" that requires you to use your own accounts. Whois Search - Go to http://www.whois.com and search for the domain name (http://www.company.com). Who comes up as the Registrant? The company name, or an individual? It is possible that the website domain could be registered under the owner's personal name instead of the company name, so this alone doesn't mean they are a scam. Is it a private registration (you can't get the details)? Again, that alone doesn't mean it's a scam necessarily. Finally, look at the date the domain was registered. If the website gives details about how long the company has been in business and the domain registration differs greatly from that, be wary. If they claim they've been providing work at home jobs for 10 years, but upon looking up the domain name you see they've been online for a couple of months, that's a red flag. Do some research - Write down the company name and the name the domain is registered under (if applicable). Go to http://www.google.com and type the company name in quotations, plus the word Scam, like this: "Company Name"+scam - see what comes up. Any negative experiences detailed on message forums? Do the same with the individual's name that the domain is registered under. 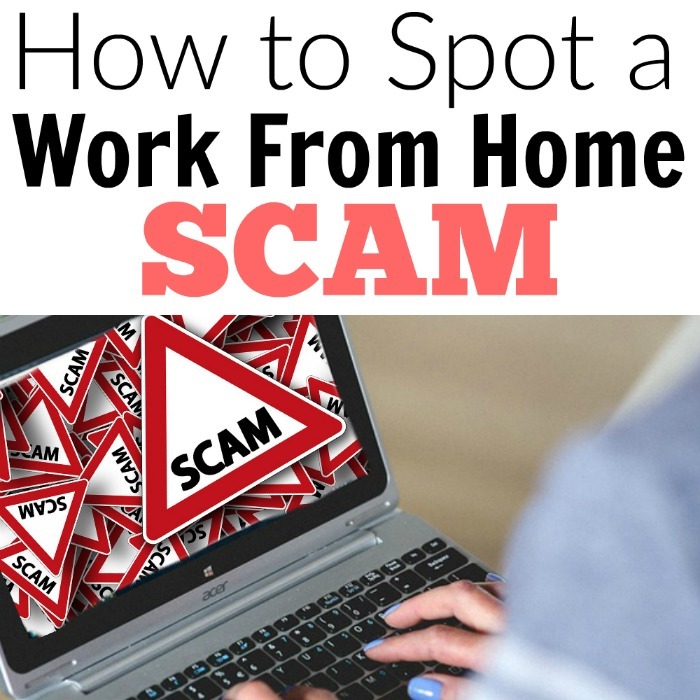 (Also try replacing the word "scam" with the words, "scheme" or "fraud.") You can also search for pages that mention the company domain name, like this: "www.companywebsite.com" - Google will return results on any page that mentions that term. Then go to http://www.BBBOnline.com - http://www.RipoffReport.com - and http://www.ScamBusters.org and search for the company and individual's name. Ask around - If you still haven't found any negative information (or any information at all), ask around. Visit work at home message forums and ask about the company. Use the forum search function to search for the company name and individual's name. If it's a scam, surely someone has heard about them. Finally, compare any work at home position with positions available in your local area. Does the online job seem like something you'd do in an office setting? Does the pay match the level of experience needed? Does the pay match the complexity of the job? Could a company automate the job functions rather than paying you thousands of dollars to do it? Remember that most companies are trying to save money, not make their employees rich. Most importantly, listen to your gut. If something seems too good to be true, it probably is. I hear so many people say, "I had a bad feeling about it, but I wanted it to be true, so I took a chance." Don't do it. If you have ANY doubts or concerns, pay attention to them. You'll save yourself a lot of grief later on.